Point Blank uses the finest gear in the business. Our gear has stood up to the abuse this fish can sometimes deliver. 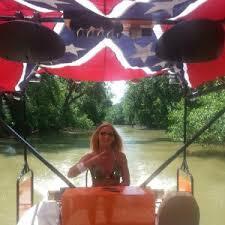 Simply the finest experience for pursuing the Asian Carp in comfort and true redneck fashion. Book now to experience the General for yourself! 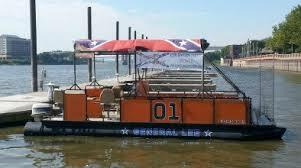 In 2010 we commissioned our own custom pontoon boat the GENERAL LEE. Compared to our competition it is unmatched in the sport by functionality, safety, and space. Some of the features of the boat include: 4 adjustable shooting seats, Fully enclosed by safety netting and steel impact panels to protect passengers, Canopy for providing shade, 4-12 inch subwoofers and 4 sets of tower speakers, LED lighting for night trips, 140 sq. ft. of space for all the gear. waterproof baggie for cell phones, cameras, ect.